Training as a graphic designer in the 1980s was a hands on affair. There wasn’t any Apple Macs in those days (at least not in Leeds) and everything was craft based. We quickly became pretty handy at rendering the things we had to commit to paper pencil, pen, market, ink, charcoal, paint — you name it we had a go at it. Of course I regularly lament the almost complete lack of traditional skills left in graphic design.I still see some of the skills I honed over the years being used in other disciplines and I think it’s because of this I adore art that is well executed. One of the key areas we focused on was lettering. Originally all letter forms had to be hand drawn and we were taught the artistically technical skill of hand drawn lettering. This would of course be superceded by computer programmes that did all the hard stuff but it was a badge of honour. A beneficial side effect of learning how to draw lettering by hand was signwriting and whether words were drawn on paper with pen or on wood in paint, the same rules applied. An entrepreneurial few of us dabbled in sign writing of a weekend to earn some much needed cash. This was again before the advent of vinyl lettering and all signage had to be hand painted. To be honest, it was a real skill and the specialist few were highly sought after and expensive. We, on the other hand, offered a cut price option with flexible terms and costs. I first cut my teeth on signs at Bramley RLFC’s ground McLaren Field, with the scoreboard itself a particular achievement and the Home Team changing room door a proud moment. Other odd assignments included multiple ancient JCB diggers proudly displaying the moniker ‘O Kane Plant Hire’ – the enthusiastic owner would take us down the pub at lunchtime, get us quite drunk and then leave us to finish off some very suspect signwriting. 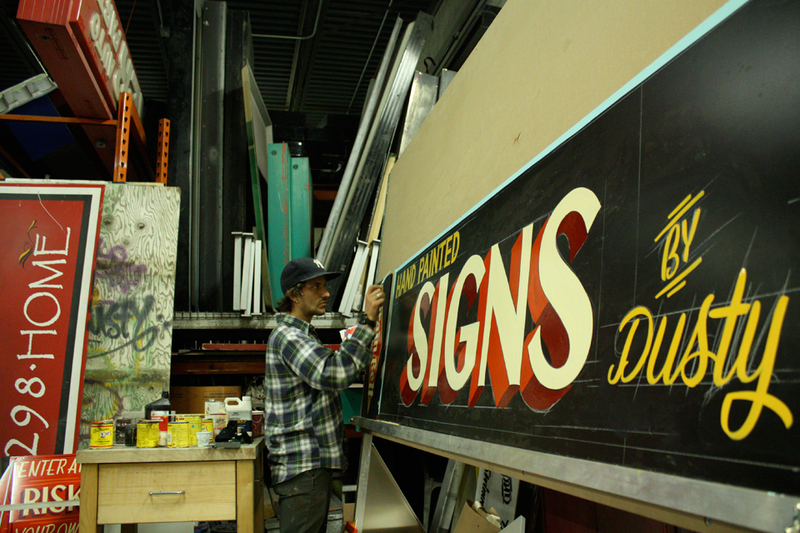 Last week I happened upon the work of an old school signwriter based in the States and looking at his work really took me back. It’s very unusual these days to see signage produced this way as there’s a real lack of the skills needed. It made me smile to see this was still happening and make me hanker after a simpler time, when there was less control over the end product but the result had more soul.